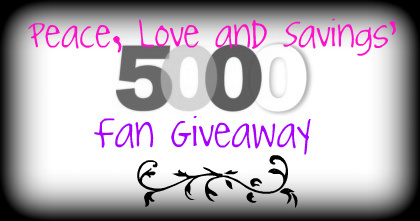 Recently Peace, Love and Savings reached 5000 Facebook fans! So, I teamed up with some GREAT bloggers to bring your a HUGE giveaway. There are some AWESOME prizes to be won. You can win coupons, gift cards, and CASH! All you have to do is enter on the RaffleCopter below. The more times you enter the better your chances are of winning one of these super awesome prizes. The giveaway will start on 1/9/12 at 12:01am and run until 1/17/12 11:59pm. A randomly selected winner will be selected for EACH prize, and that specific blogger will contact the winner by email. Once contacted the winner then has 48 hours to reply, or if they fail to reply another winner will be selected.